After nearly 6 weeks in France we decided we were ready for a new country …. something drastically different perhaps? So we drove about 4 hours north east across the boarder and we landed in Belgium. For those you who haven’t been, Belgium is pretty similar to France, although citizens of both countries might choose to deny it! However, we had some friends in Brussels so we thought we might go and visit for a few days. The first thing we did was have a belated little birthday Party for Tom. It turns out you really don’t need much for a kids party when on the road. I managed to find some cute little party plates, balloons and bubbles. My friend Erin had half a cake left over from the day before and some lollies. We put candles on the cake, sang songs and the kids were over the moon! I am always a fan of letting the kids blow the candles out as many times as they want. This was pretty easy this time around as there were only 4 little ones. 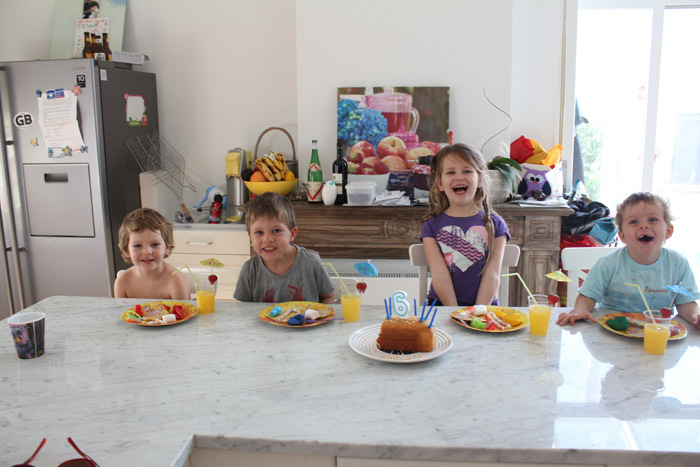 The simplicity of this little birthday party blew me away. Back home every time we have a kids party it usually takes up a day of cleaning, tidying, shopping, food prep and cake decorating. Not to mention the 2 – 3 hours of party and then the aftermath! I love the fact that when we are on the road all expectations are thrown out the window and whatever we have is always enough. Tom couldn’t have cared less that his cake was half an old, undecorated, sponge cake. He was just happy to have a moment that was dedicated to him with a few friends. My friends kids were also really happy to be part of a birthday party and Milo is just happy all the time. Seriously Bubbles are the best invention in the world. It never ceases to blow me away how much a $1 bottle can entertain children. Our Happy little chickens! Smiles all around! Never underestimate the power of an umbrella in your drink. The kids thought all their Christmases had come at once! Another wonderful perk of having friends in town meant we were able to go out on a date! It had been over 2 months since we had been on our own without the kids so this was super exciting (possibly a little too exciting!). I absolutely LOVE being with our kids all the time, but it was nice to have a wee break. We caught the train into the heart of Brussels and went off for a look around. It is a really vibrant little city and there was certainly a lot going on. We stumbled across some markets (is there anywhere in Europe that doesn’t have a market?) and checked out the local handicrafts. There were some beautiful scarves and wooden carvings. We are trying to travel as light as possible so most things are bought on a ‘need’ basis. Sometimes I wish I could carry more, but then other times I am kind of glad for the restriction. I found a quote a long time ago that said “You don’t need to own nice things in order to enjoy them”. It really rung true for me and I have had to repeat it to myself on more than one occasion. Part of our big life change was about cutting out the crap, getting rid of things we no longer needed or used. It was incredibly cleansing, long-winded and time-consuming. I just need to think of this process and it is enough for me to not need to buy anything to ‘remind’ me of a place. AVOID this street at all costs! The reviews on trip advisor are hilarious! Other things to see in Brussels are the plenthor of Chocolate Emporiums that are found everywhere, complete with chocolate fountains, truffles, chocolate coated strawberries and chocolate in all shapes and sizes. Belgium is also famous for its delicious waffles, frites (chips) and Beer. Where NOT to eat in Brussels! We found a lovely little laneway off Place d’Espagne filled with delightful looking restaurants. It looked very touristy, but we had no idea where to go so we thought we would pick on and give it a try. I am going to have to be honest. It was probably one of the worst meals we have ever had LOL. The waiters, who couldn’t have done enough for us to get us into their restaurant, turned into complete jerks as soon as we sat down. The food despite looking good, was well below average, the service was abominable and on the whole we felt a bit cheated out of our wonderful date night meal that we were so looking forward to! Don’t get me wrong. I am no princess when it comes to food. I LOVE good food and I can eat on the side of the road with the rest of the world, however this place just was the pits, the other restaurants all looked like they were similar so I would avoid it all together if you can. Here is my review of the restaurant on Trip Advisor and if you are in for a bit of a giggle read the other reviews too – It turns out I am not the only one who felt the same way! The Place d’Espagne is absolutely beautiful. We spent the late afternoon and early evening, wandering around and enjoying the magnificent spendor of the Grand Palace and all the wonderful old buildings surround it. After the sun went down the Palace lit up and was quite spectacular. We tried to take a photo but couldn’t get one that wasn’t too blurry. We were also a little disappointed to find out that we missed out on the Brussels Flower Carpet which had been there the week before, where they had made a beautiful flower carpet on the floor of the entire square. Oh well … next time! After dinner we needed to rectify our evening’s meal, so we went and bought a waffle and a Beer and sat in a little square and drank our stein’s in the fading sunlight. It was lovely to just sit back, chat and relax on our own. We really are having a wonderful trip and love spending so much time together as a family. First Stein on this trip!